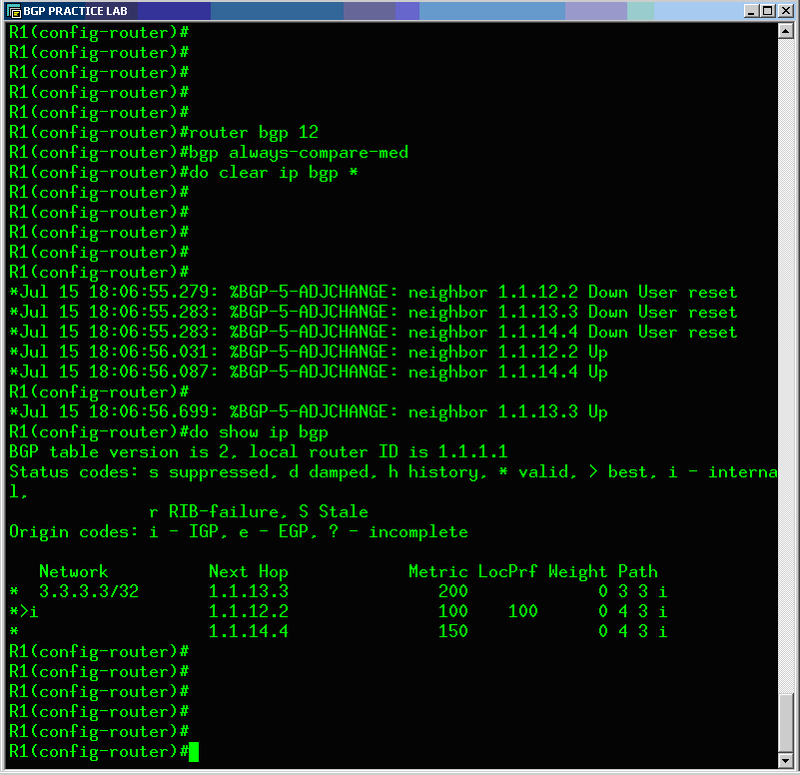 The BGP MED – Deterministic vs Always-compare. tin tin !!! Main Cisco Document Link about the topic in this post. 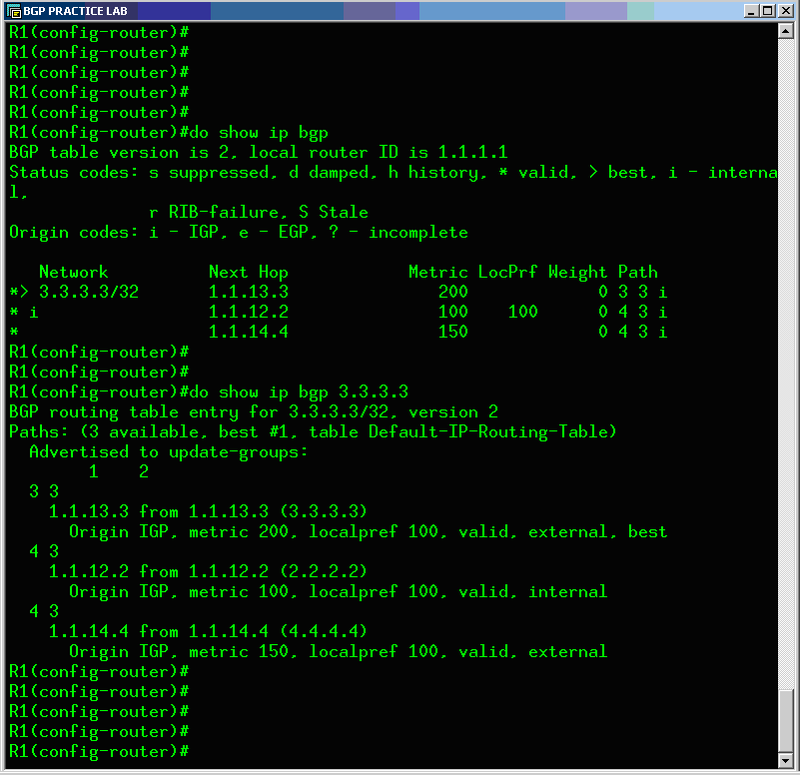 Note: When BGP receives multiple routes to a particular destination, it lists them in the reverse order that they were received, from the newest to the oldest. 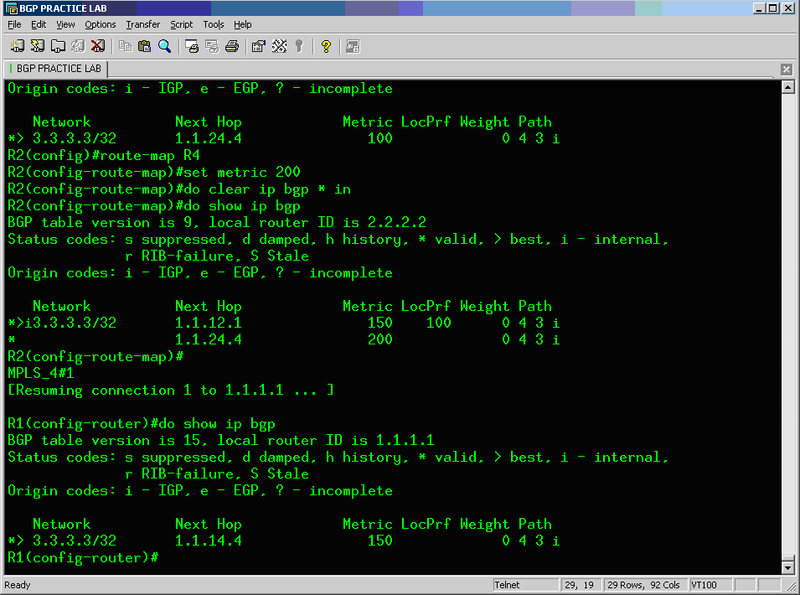 BGP then compares the routes in pairs, starting with the newest entry and moving toward the oldest entry (starting at top of the list and moving down). For example, entry1 and entry2 are compared. The better of these two is then compared to entry3, and so on. 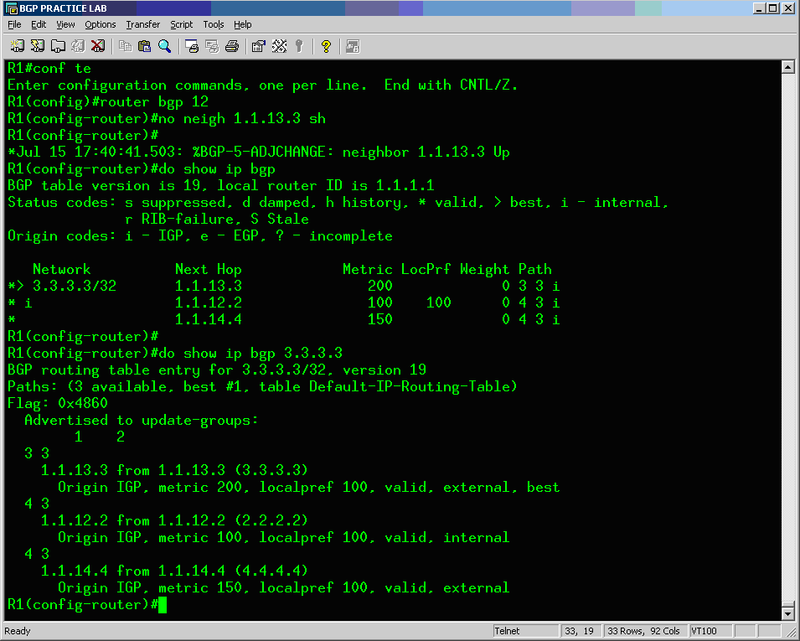 we can see that to get to the 3.3.3.3 network, R1 is choosing R3 as the best path because of Step 7 of the BGP Algorithm Process should win here again (Ebgp over IGBP), without comparing any med value. we can see that we prefer now the path towards R2, because of a lower MED value, if we change the metric to something higher than R4’s metric announced to R1, in R2 (say 200). Entry1 is compared to entry2. 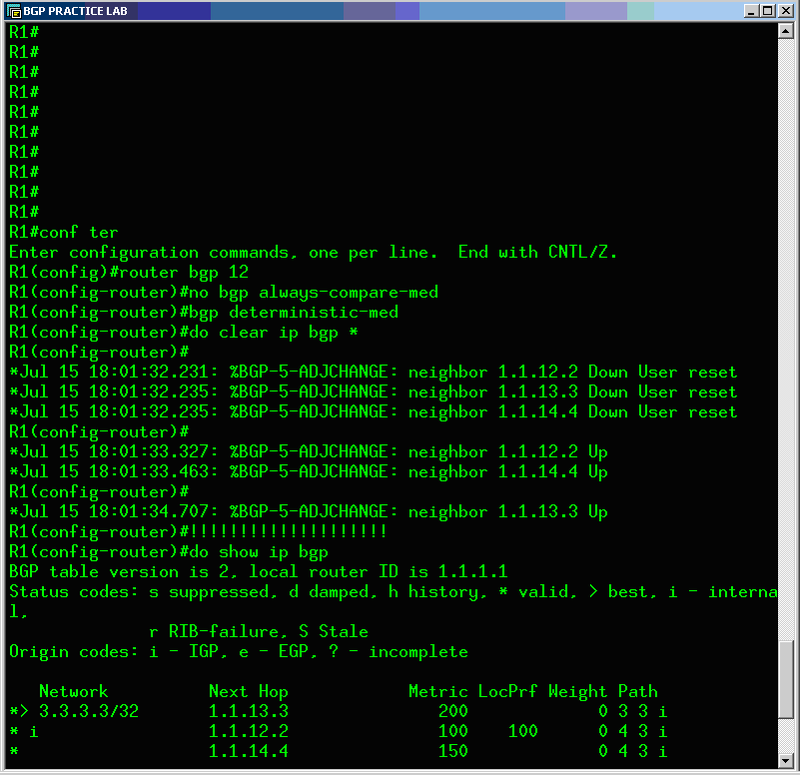 These entries are from different neighbor autonomous systems, but since the bgp always-compare-med command is enabled, MED is used in the comparison. Of these two entries, entry1 is better because it has a lower MED. Next, entry1 is compared to entry3. The MED is checked again because the entries are now from the same autonomous system. Entry3 is chosen as the best path. from this output we determine that Entry 1 received from 2.2.2.2, with AS 4,3, Entry 2 received from 4.4.4.4 with AS 4,3 and Entry 3 comes from 3.3.3.3, with AS 3,3. Entry 1 is evaluated with Entry 2, since both entries transport the same AS information, the Step 6 of the decision process is now perform, and the best path is Entry 1 because it has the lowest MED and wins over the med that carried in Entry 2. Step 6 of the decision process. Now Entry 1 is compared with Entry 3, and Entry 1 (lowest MED) is the winner of the election process because of the ALWAYS-COMPARE-MED, configuration done in the BGP Process. And this is testable by the outputs before enabling the always-compare-med, so we are like relaxing a little bit the rule of step 6 … This comparison only occurs if the first (the neighboring) AS is the same in the two paths. and instead of not comparing the MED Value of the route received over to different AS, with this command we can now compare the entries with the MED Value even if the Entries are not from the same AS. There is a group for AS 100 and a group for AS 500. The best entries for each group are compared. Entry1 is the best of its group because it is the only route from AS 100. Entry2 is the best for AS 500 because it has the lowest MED. Next, entry1 is compared to entry2. Since the two entries are not from the same neighbor autonomous system, the MED is not considered in the comparison. 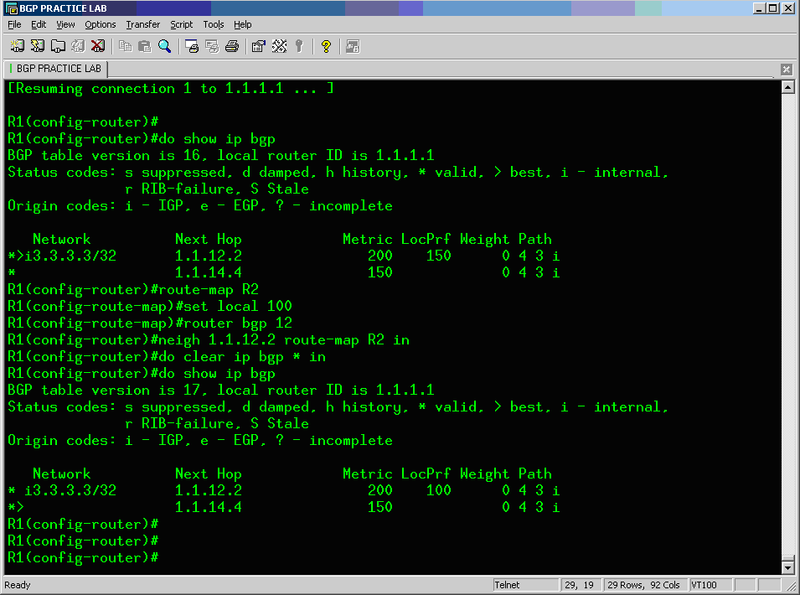 The external BGP route wins over the internal BGP route, making entry1 the best route. Now if we enable always-compared-med & deterministic-med, entry 2 of group #2 wins against entry 1 of group #1, because of a lower MED Value. 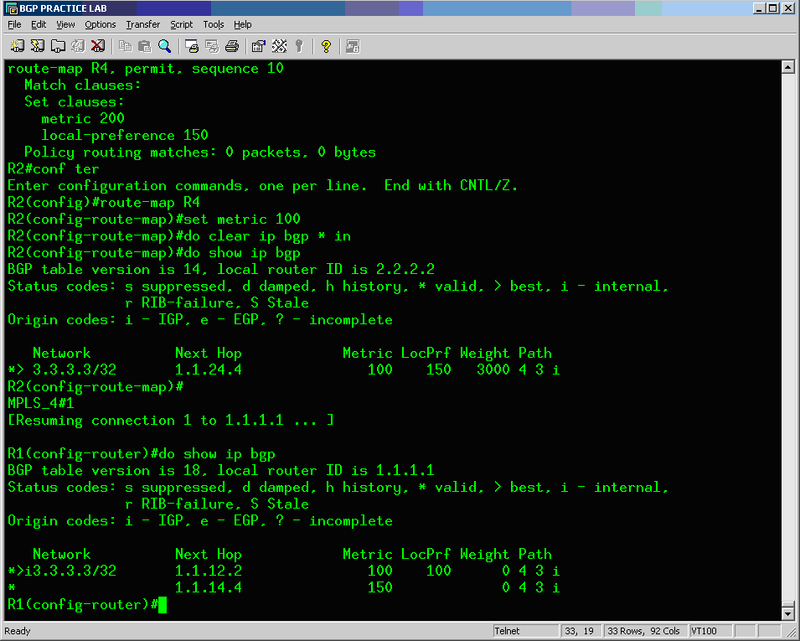 Enabling the bgp deterministic-med command ensures the comparison of the MED variable when choosing routes advertised by different peers in the same autonomous system. 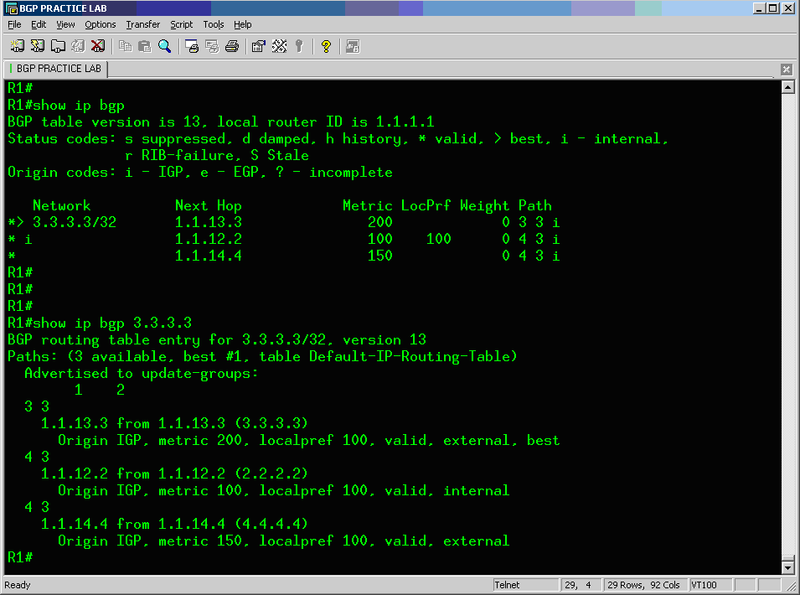 Enabling the bgp always-compare-med command ensures the comparison of the MED for paths from neighbors in different autonomous systems. 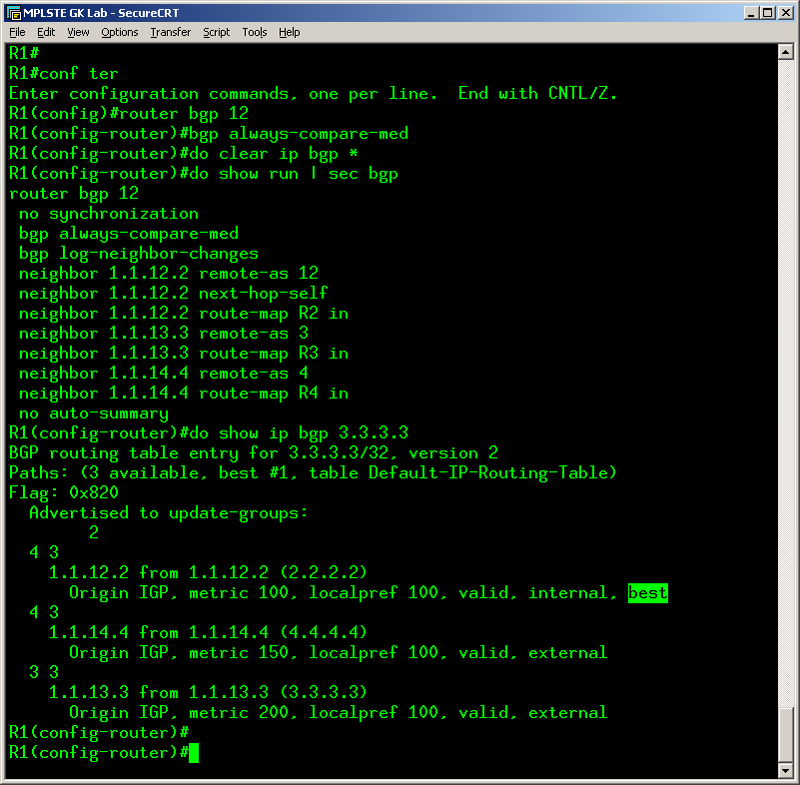 The bgp always-compare-med command is useful when multiple service providers or enterprises agree on a uniform policy for setting MED. 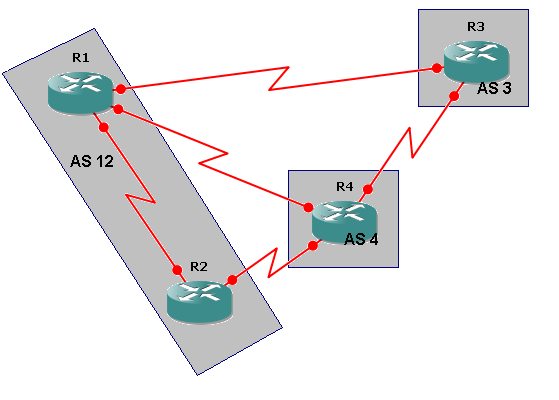 This entry was posted in BGP, Cisco, Technologies. Bookmark the permalink. 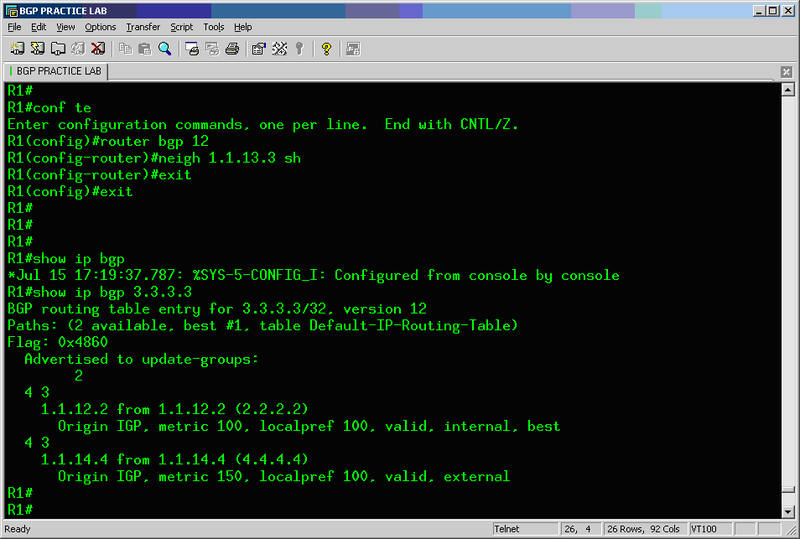 ← 3 New CCNA Certifications.